La Cañada Elementary School, helps students study microscopic images during lunch Monday. This week at La Cañada Elementary School, lunch recess is for Science, Technology, Engineering, Art and Math. You know — playtime! For the second year, LCE is celebrating STEAM Week. Each day, students can gravitate to the Science Center on the northeast corner of the playground to engage in a range of hands-on activities, such as Monday’s microscopic samples. In the shade of the center, students took turns hunching over microscopes, peering down at slides featuring animal, plant, insect and flower parts. Raphael Vayng, a 3rd-grader, said this was only the second time he had an opportunity to use a microscope — and he was loving it. With help from the PTA’s STEM fund, parent volunteer Amy Nespor designed STEAM week and Saturday’s district-wide Maker Faire that it’s leading up to. On Tuesday, she put the “T” in STEAM with technology, with LCE students experimenting with copper tape and circuits. On Wednesday, it was “E” for engineering, when students built towers with post-its. On Thursday, the focus is scheduled to be on art — “A” — with students creating posters of comets. On Friday, the plan is “M” for math, with an open invitation for kids to play math games. Saturday’s Maker Faire — La Cañada Unified School District’s second annual — will be run primarily by students who, from 10 a.m.-2 p.m., will host a festival for anyone interested in STEAM. The free event, open to the public, will showcase “makers” from each of the district’s elementary schools and La Cañada High School. There also will be a range of opportunities to experiment with cooking, sewing, engineering, tinkering and science. There will be telescopes and stomp rockets, soap- and safe slime-making, and a giant chessboard. Mathnasium will send representatives, Jet Propulsion Laboratory will send a rover and the YMCA’s STEAM truck will roll onto campus, along with a food truck. 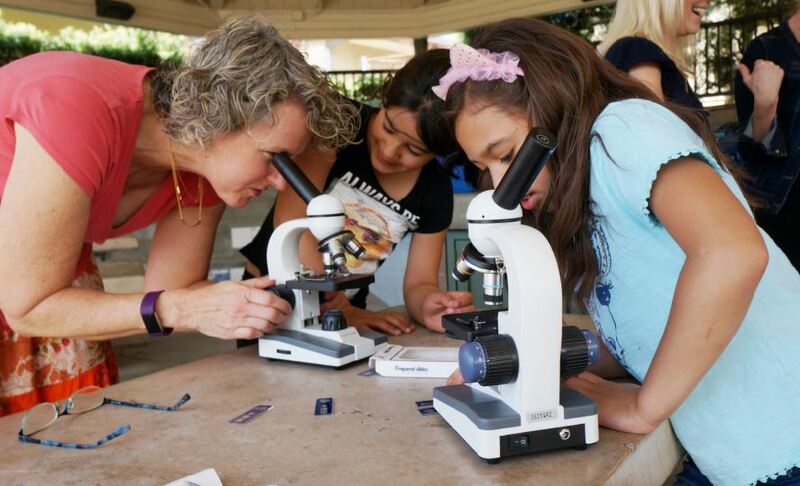 La Cañada Elementary School students spent time hanging out at the Science Center on Monday to experiment with microscopes set up as a part of STEAM Week on campus.